Fans of the IWC Portuguese collection, do not adjust your eyes. This 2013 model is not an unattainable special edition, but the new Portuguese Chronograph Classic, and it is magnificent, is it not? Better still, the improvements are not simply cosmetic, inside is the in-house Calibre 89361, an addition which I feel will elevate this piece to "grail watch" status for this collection's many enthusiasts. Firstly, the aesthetic amendments, because they are commendable - an up-size to 42mm with case choice of either steel or rose gold. On the dial, the 12-hour counter features a two-handed display which offers utmost readability and adds instant symmetry, as it forms an affinity with the hour and minute hands - especially when posed in the most common "photography o'clock" position of 10.10-ish as shown. This in turn is balanced by the small seconds counter at 6 o'clock. Both subdials are recessed and snailed, adding subtle styling details, and the applied numerals are still reassuringly diminutive. Not even the busyness of the reinstated railtrack edge, nor the various indications including a date window, detract from the overall character of this piece - it still manages to retain the face-on bareness and empty dial space synonymous with the Portuguese collection. The in-house calibre 89361 features a fly-back chronograph and it is meticulously decorated with Geneva stripes, all visible through rear-case sapphire. The IWC Portuguese Chronograph Classic is available with slate grey or silver dial editions and the addition of supreme quality Santoni leather straps is but an added bonus. Incidently the IWC official website is also praiseworthy, packed with news, a blog and a moderated forum. Not merely a brand calling-card, its regularly updated content is a showcase feature and one which puts so many other sites in the shade. View it here. 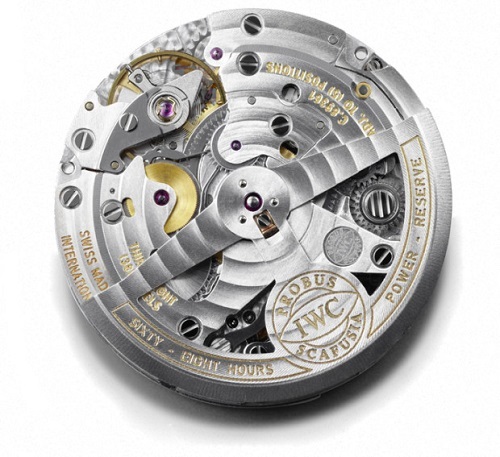 Or perhaps a look-see at our IWC articles - no nasty copy and paste press releases, all original stuff - here.